Objective: I can multiply fractions and whole numbers. 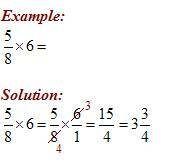 Fractions are multiplied by multiplying numerator by numerator and denominator by denominator. The fractions may be simplified before multiplying. Whole numbers have the understood denominator of 1. Read this lesson on multiplying fractions if you need help on how to multiply fractions. Multiply the fractions and whole numbers.